Hi there, I'm Donna from pet therapy. Do you like dogs? (patting the bed to allow Micron to put his front paws up) Yeah? Well, this handsome fella is Micron, who . . . AUGH! Micron! Drop it! It's Wednesday evening and Micron and I are at the Dayton VA Medical Center. We're on a test run with our pet therapy classmates to observe how our dogs react to folk in a medical environment. 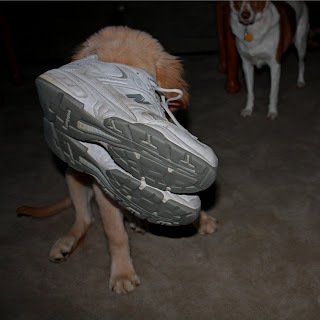 And I watch with horror as my goober dog goes snout deep into a size 11 shoe sitting on the bed (snuffle snuffle) only to then grab it with his pearly whites. Lookit y'all. I gotcher sneaker! His tail wagging heartily the whole time. Over the past few weeks of our pet therapy classes, we've been absorbing a lot of info. Stuff we need to know to be a certified Pet Therapy Team. Recognizing calming signals and stress in our dogs, as a for instance. On this week's visit to the VA, this may be the first time our dogs will experience this particular package of sensory load that is the medical environment. Will any of the unfamiliar sights, smells, sounds and that slick vinyl flooring bring pause to our dogs in training? I understand that my dog is my first priority. We've been told this by the trainers and of course I have total buy in. At the first sign of overload, I am prepared to make a graceful exit and remove my beloved Micron from the situation. In hindsight, it's too bad Micron wasn't told the same thing. Hey Micron, what about signs of stress in me, dude? Oh, he's doing fine. Wheelchairs, moving beds, beeping noises go past his notice without a glancing thought. All he wants is to greet people and be petted. Right after he smells you real good, that is. His new friend, Harley the chocolate lab, is in front of us greeting a fellow. Micron is nearly quivering with anticipation (my turn-my turn-my turn-my turn). Ok, Micron, I say, Let's go, giving him permission to approach for a greeting. Good grief. He's all hey hey my name's Micron I'm a dog are you a dog no well let me smell you first yep you're a person i like your shoes can i lick your hand do you have something in your other hand no ok can i lick it anyway ooh you had meatloaf for dinner didn't you I like chickens but the food lady doesn't can I hold your sock in my mouth for a minute. And so it goes. Yeah, I say, my dog can't hold his licker. Ha Ha. heh. Sorry, we'll just move along now. And so I shorten the leash and take the chowder head to look for the next dog appreciator. I gotta say, I was really hoping he would have done just a little better on this trip. Micron's visited family at a couple of different assisted living centers and has always done us proud. On those visits, he's able to bring up some past service dog training to walk in a perfect heel along a wheelchair. Calm and gentle, he's been a welcome sight. So what had him so wound up last Wednesday at the VA? You know what? It was all on me. Three days into the workweek, I hit a level of stress that would lead a lesser woman to drink straight from the bottle. Then just starting into my sixty mile drive to get to the VA, I was delayed in a traffic jam. It's a mandatory class tonight, I lamented to Micron, we really gotta show up. All the things I had planned to prepare for the evening's class (brush the dog, read today's comic page, eat something) was lost to time. Finally pulling into the parking lot, I was on edge. Jittery. Sensing all this, but not with full understanding, Micron went on Yellow Alert. Something's going down at this new place, thinks he, Oh hey look! My friends are here! Hey, Harley! Sup, dawg? And I can mark this point in time as when his brains cells went on a coffee break. Back in fifteen!, say the neurons. Nothing to do now, but break out a couple of dog cookies to get his focus back. I wave the biscuit goodness past his nostrils aaaaand He's Back! There you are,big guy, I say, getting some eye contact, I missed you. We'll get better at this pet therapy thing, you know. When I say We, I really mean Me. Micron is, well, Micron. I know that and there's nobody more familiar with his eccentricities than I. It's my job to anticipate his misbehavior to keep the dog slobber off people's tennies. So, I'll get better at this thing. We're nearly finished with the classes now. One more week, then [gulp] the Certification Test. I'm actually looking forward to the test, because I'm sick that way. But I think we'll do just fine. And by We, I mean Micron. Micron will do fine. I'm off now to practice deep breathing.